The brief:- To create the ultimate, luxurious en-suite Spa-style Showering Experience… from a walk-in wardrobe! 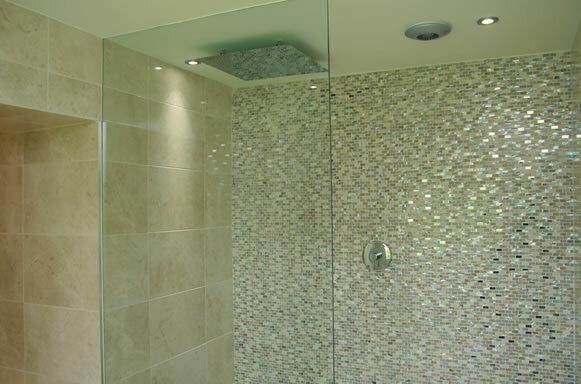 This now gorgeous and luxurious spa-style shower room started life, rather prosaically, as a large walk-in wardrobe. The Cinderella transformation commenced with the introduction of new plumbing, drainage and electrics, all concealed so as to create clean, clear sufaces in the finished shower room. In pride of place is the shower, but not just any shower! To deliver a drenching, monsoon-like experience, a huge square 50 cm x 50 cm chrome showerhead was sourced. The concealed pump delivers a cascade of water for a truly exhilarating shower. 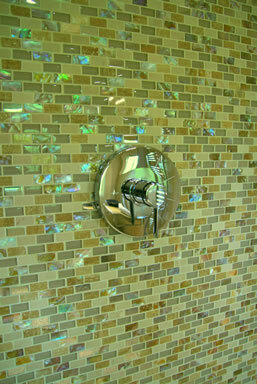 To define the wet zone, a single piece of toughened and bevelled glass was commissioned. No fixings are visible to mar the deceptively simple design. This massive and beautiful piece of glass screens a showering area large enough to enjoy with the whole family! One entire wall was covered in specially sourced mosaic tiles. Tiny chrome and pearlescent pieces sparkle and glitter, reflecting light and lending a stunningly glamorous effect. The remaining wall areas are covered, also from floor to ceiling, with oversized, glossy, cream marble tiles in a ‘brick wall’ pattern to contribute to the calming ambience while maximizing all the available light. 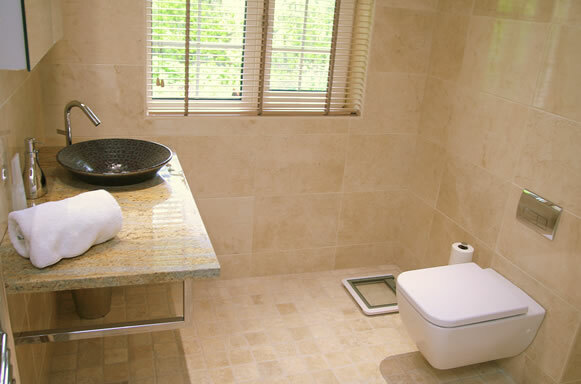 Almost 1000 small creamy tumbled marble tiles – each unique – cover the entire floor in both the wet and dry zones. The matt finish of the tumbled marble ensures a safe, non-slip surface without sacrificing the inherent style. A truly stunning feature of the room is the beautiful hand decorated wash basin. After much research and many disappointments, this was eventually sourced from Italy. To support the basin and reflect its colours and tones, a bespoke shelf was the chosen option. Many visits to stone suppliers were necessary to view hundreds of pieces of stone. The perfect piece of granite was eventually located, then cut to shape and polished to form a wide shelf into which the feature basin was inset. A simple but stylish column mixer tap completes this unique tableau. The attention to detail in the design of the shower room ensures that all pipe-work, electrics and fixings are unseen, concealed beneath tiling or above the new false ceiling. The entrance to the shower room from the master bedroom was through an unprepossessing lobby. A new glass shelving unit now displays fluffy towels and toiletries, and by cleverly continuing the unusual bedroom wallpaper into this lobby area, it now contributes an essential ingredient to this luxurious sleeping and showering environment. Some elements of the shower room proved challenging for the builders. On occasion they had to be persuaded to adopt new techniques to achieve the desired outcome. 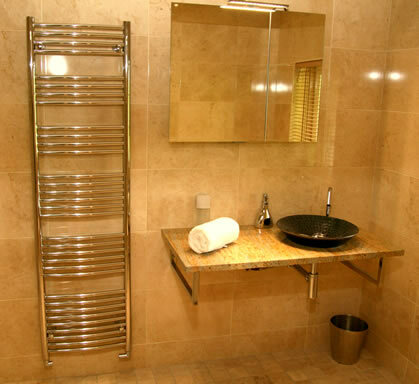 The clients are thrilled with their new shower room which combines glamour, functionality and elegant good taste.